These were at a house across the street from the library. 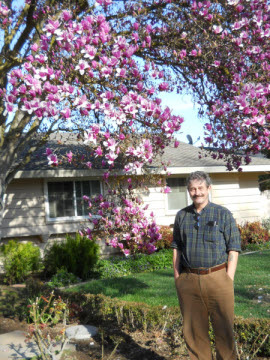 Me - slightly overweight 60ish man, under a tulip tree. These were in a garden. The blossoms are no bigger than the fingernail on my little finger. Almond blossom in our yard. She took a delight in butterflies. 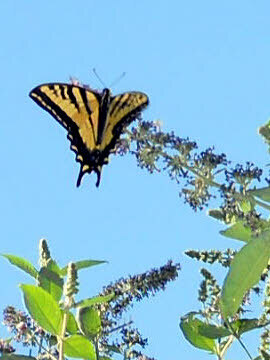 This is a tiger swallowtail on the "butterfly bush" in our yard. 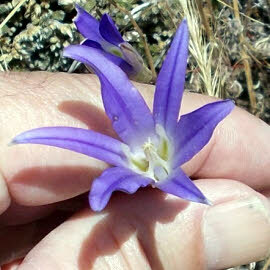 Tiny, delicate flower in the Sierra Nevada; my hand for scale. 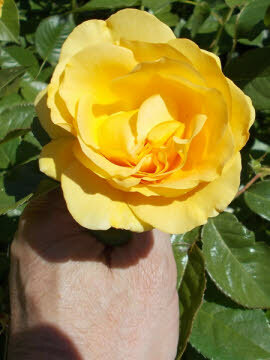 She liked roses; this one is in our yard. 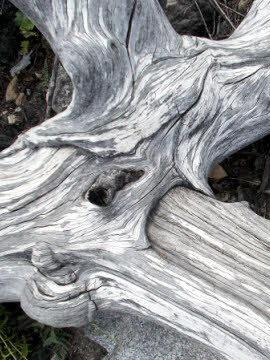 I didn't always send her a flower; the weathering on this old log caught my eye on a hike. Her name was Shirley, and when we met she was fighting breast cancer. Fighting it tooth and nail; with chemotherapy and, later, radiation. It was one of those random encounters on the Internet. I've forgotten exactly how we met, but we did. She mentioned the breast cancer. I sent her a picture of a flower and a short message. "Get well soon" seemed too trite for someone facing death, so I just wrote "best wishes". It cheered her up, and she thanked me. I sent another, and she thanked me again. What the heck, I thought, I've got a digital camera, and if I spend a couple of minutes a day making someone happy, it isn't time wasted. Over the next two years I sent her a picture of a flower almost every day. These are some of my favorites, reduced in size. I spent ten years with a dial-up connection, and I'm still wary of 4 megabyte jpeg files. 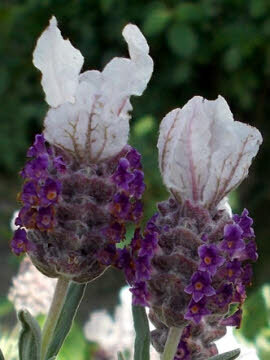 I reduced the flowers I sent her to 600x450 and 300 KB, mostly. These are all 270 wide. It would have been easy to go into Google images and search for roses or orchids or other flowers, but that seemed like cheating, to me. If picking flowers for Shirley was to be a game, it had to have rules. One was that I "pick" the flower myself, in our yard, a neighbor's yard, a complete stranger's yard, at a park or in the wild. Once I explained why I wanted to take a picture, no one ever refused permission. 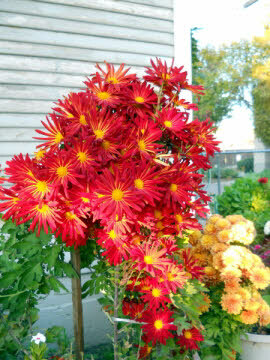 Jerry, a fellow who lives down the road from us and raises prize-winning dahlias, spent an hour showing me his collection, and told me more about dahlias than I'd ever known. I got three weeks worth of pictures from him. Carrying my camera became a habit, as did looking for a flower for Shirley. Some days I'd get two or three, some days I would not. On a day hike in the Sierra Nevada with my son in early summer, I got twenty. 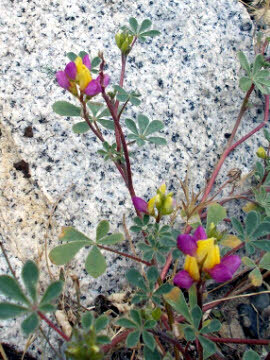 Some were smaller than a coin - see "Tiny delicate flower in the Sierra Nevada". Some were bigger. The tulip tree, also called saucer magnolia, was taller than its house. 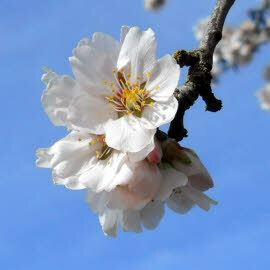 Each individual blossom was as big as a softball. Taken as a whole, it was spectacular. The couple who lived there were thrilled I admired their tree. My favorite example of a win-win situation comes from a Reader's Digest anecdote I read years ago. The man who told it was walking in the park. He saw a second man, on roller skates, with an owl on a leather patch on his shoulder. The roller skater was going as fast as he could, and the owl was flapping its wings to beat the band. On his way back, the walker saw the owl man sitting on a bench. He commented that you don't see many people with owls on their shoulders rollerskating. The owl man said "I got him about a year ago. He ran into a power line, and he's never going to fly again. But, I got a permit from the Fish and Game Department to keep him. We come out here twice a day, and he can pretend he's flying." The walker said that was an awfully nice thing to do for an owl. The owl man said "Well, it works both ways. Since we started I've lost 20 pounds and stopped smoking." Finding a flower for Shirley worked both ways too. 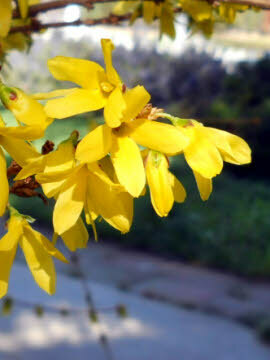 Until I started, looking, I didn't know just how many pretty flowers there were in my part of the world. I got three different ones in a vacant lot in Turlock one fine spring day. One November I took my car in to have the wheels balanced. I walked from the tire shop to a Taco Bell, and found six flowers along the way. Three were in an apartment complex's entrance flower box, but the other three were growing wild in odd nooks along the way. We wrote of small things; I updated the church web site or gave away persimmons. She canned tomatoes and cooked purple hull peas. One day she told me she'd been happy to scrub her front porch. I realized that surviving cancer would put a certain perspective on life's mundane chores. She told me a bit about her husband, I told her a bit about my wife. Our relationship never went beyond being electronic pen-pals. I never considered myself a threat to anyone's marriage; see above, slightly overweight 60ish man under a tulip tree. Nevertheless, after two years her husband demanded we stop writing. I'm going to miss picking flowers for Shirley.